Struggling to decide between the Garrett AT Pro and AT Gold? You've come to the right place! In this comparison article, find out the differences between the two machines - and learn which is the best option for your requirements. 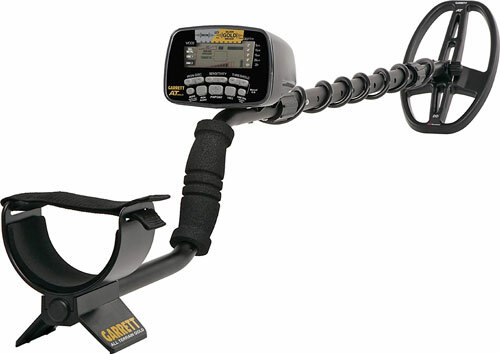 Garrett is one of the most popular metal detecting brands - and for good reason. The company has a reputation for manufacturing high-quality machines that are reliable, effective and provide great value for money. Two of Garrett’s most popular models are the AT Pro and AT Gold. These detectors, along with the newer AT Max, make up the much-loved AT series. What are the differences between these two machines though? And which is best for your requirements and budget? It's a fair question - and the answer isn't immediately obvious. On the surface, the AT Gold and AT Pro appear to be similar devices. Both models share a number of features, are designed to be used on any terrain, and are waterproof to a depth of 10 feet. They are also highly rated by detectorists and have a fast response time. These similarities can mask some important differences between these two detectors though. In this article, I’ll take an in-depth look at how the AT Pro and Gold compare to help you make the right choice. Both the AT Pro and AT Gold are excellent metal detectors. They provide numerical target ID, excellent sensitivity, manual ground balance adjustment and are waterproof to a depth of 10 feet. There are some important differences between them though - here's a quick overview. The AT Pro has an operating frequency of 15kHz, while the AT Gold has a higher 18kHz frequency. How does this affect each machine’s performance? The 15kHz frequency of the AT Pro makes it an excellent all-rounder. It’s great for detecting relics and coins in a variety of conditions, which is why it’s become such a popular detector. The lower frequency means it’s less sensitive to smaller objects than the AT Gold, but it provides greater depth and is better for detecting higher conductivity targets (such as silver). With its higher 18kHz frequency, the AT Gold is more sensitive to smaller targets and gold nuggets. It’s also better at hunting lower conductors, such as buttons or bullets. A higher frequency means it provides less depth than the AT Pro though. Both detectors come with similar LED displays and controls. The screen itself is clear and easy to see, but neither has a backlight which may be an issue if you hunt in low-light conditions (the AT Max does include a backlight though). Mode - The left portion of the screen displays the various search modes on each detector. You can cycle through these by using the “MODE” button. Target ID - Both detectors display a numerical target ID depending on metal conductivity. This is displayed as both a large Target ID in the center of the screen and as a segment with an estimate of the type of metal. Depth Indicator - Both detectors have a coin depth indicator with a maximum of 10”. Sensitivity - The sensitivity of both detectors can be easily adjusted. The current level is displayed at the bottom of the screen. Battery Level - Both detectors display a current battery level at all times. While the screens of both detectors provide the same information, there are some differences in button configuration. Both detectors have plus and minus buttons for sensitivity and iron discrimination, along with “Iron Audio” and “Pinpoint” buttons. The AT Pro has options for notch discrimination though, which are not included with the AT Gold. Instead, the Gold has a threshold function, which allows you to adjust the audio so targets are easier to hear. Both the AT Gold and AT Pro feature digital target ID. The detector’s display shows a number between 0 and 99 depending on the target’s conductivity. While Target ID is a standard feature for mid-level detectors, it's useful to have and can save time digging unwanted targets. The Gold comes with three search modes: True All-Metal, Discrim 1 and Discrim 2. These all use the "Pro" audio mode. The AT Pro model has three discrimination patterns: Custom, Coins or Zero. Unlike the AT Gold, each can be used in both Professional or Standard modes. It’s worth noting that the AT Pro doesn’t include a true all-metal mode. There is a “Zero” mode, which is similar to all-metal when no discrimination is used, but at a technical level these are not equivalent. It does have a notch function for setting acceptable targets though. In contrast, the AT Gold has a true-all metal mode to maximize detection depth and sensitivity (particularly for gold nuggets). It doesn’t include adjustable notch discrimination though. The AT Pro and AT Gold both include an electric pinpointing mode for getting a more accurate target location. Most detectorists prefer a separate pinpointer, but this is still a useful feature to have. 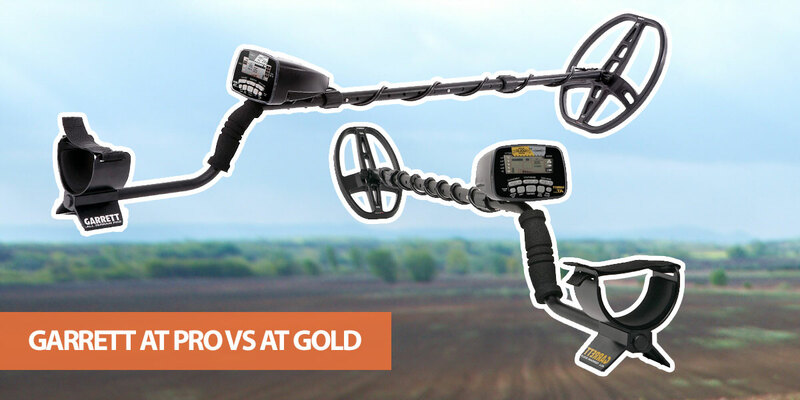 Unlike cheaper Garrett detectors, such as the ACE 250, both the AT Pro and AT Gold provide manual and automatic ground balance. This provides more control over how the detector handles mineralization. Manual ground balance is particularly important in tough ground conditions, such as areas where gold is often found. For this reason, it’s an essential feature when buying a detector for gold prospecting. The AT series includes around 40 levels of iron discrimination. This allows greater control over which targets are filtered. Both models also include Garrett’s trademarked “Iron Audio” system, so you can audibly pick out trash items such as bottle caps next to iron. This is a great feature that can save plenty of time and frustration when hunting. If you want to hunt in shallow rivers, streams, lakes or creeks, the AT Pro and AT Gold have submersible coils and waterproof control boxes. Both machines are suitable for use in freshwater up to a depth of 10 feet. One of the differences between the detectors, however, is that the AT Gold is not suitable for use in saltwater. This is because it can’t ground balance to salt. The AT Pro can ground balance to salt though. If you’re going to be hunting at the beach, the AT Pro is the obvious choice - and it's great as a shallow water detector. Note: The standard headphones included with the AT Gold and AT Pro are not waterproof. If there’s a chance of the headphones being submerged, make sure you buy a pair that are fully waterproof. The AT Pro and AT Gold both include Garrett’s Pro Mode Audio, but the AT Gold doesn’t include the standard binary audio. The AT Pro allows you to switch between the modes, with the “Pro” audio providing varying tones depending on the characteristics of the target (such as depth and target size). The Standard mode is easier to use for beginner but doesn’t include proportional audio. The AT Gold includes Garrett’s “Ground Balance Window” technology. By using this feature, you can “spread” the ground balance for a range of values. This helps handle mineralized ground that consists of varying soils and rocks, each of which requires a slightly different ground balance. The AT Pro doesn’t include this feature. Both detectors can be adjusted from 43” up to 56”. The AT Gold is marginally lighter at 2.8lbs compared to 3.03lbs. Like most Garrett detectors, there are several detachable parts for easier transportation and storage. The AT Pro comes with an 8.5” x 11” DD PROformance searchcoil. This provides excellent depth and allows you to cover ground quickly. As the AT Gold is designed to search for smaller items, it has a smaller 5” x 8” DD PROformance searchcoil. This can’t provide the same depth as the coil provided with the AT Pro, but is more sensitive to smaller targets and provides excellent target separation. Both detectors include basic headphones that are acceptable for hunting on land. These headphones are not submersible though, so for underwater hunting you’ll need to buy a different pair. It’s worth noting that the AT Max is built with integrated wireless technology for headphones. This function is not included with the AT Pro or AT Gold. The Garrett AT Pro is around $100 cheaper than the AT Gold at the time of writing. This may change, although the AT Pro is likely to always be a cheaper machine. Does the AT Gold provide enough extra features to warrant the higher price though? If you’re interested in gold hunting, then I think it does. Even though it’s more expensive than the AT Pro, it still provides outstanding value for money. If you’re not likely to need the higher frequency, then the AT Pro is the better all-rounder. It probably won’t surprise you that both these Garrett detectors provide excellent performance in the field. They are both relatively lightweight and easy to use, plus they provide great sensitivity. In fact, the AT Pro is one of my top all-rounder recommendations, while the AT Gold made it onto my list of the best gold detectors (click here for the full list). As you would expect, the AT Gold performs best when hunting smaller gold nuggets, relics and jewelry - especially when paired with its standard 5” x 8” DD search coil. The AT Pro isn’t so hot on small targets, but as an all-rounder it provides great performance. The larger 8.5” x 11” search coil also provides increased depth. While each machine is designed to fill a certain niche, both detectors provides a broad range of potential uses. While the AT Gold is better suited to small objects and gold nuggets than the Pro, it’s still a versatile device that can be used for gold and relic hunting. In this sense, the “Gold” name is slightly misleading. Both detectors also have an excellent recovery time. If you need a detector that can pick out genuine targets that are close to trash items, the AT series is a great choice. They can also pick out multiple targets that other detectors would see as a single object. Both the Garrett AT Pro and Garrett AT Gold are excellent metal detectors. They are easy to use, lightweight and provide plenty of features for both novices and experienced detectorists. They also come with a two-year warranty and a durable design. If you’re interested in detecting gold, but would like the option of occasionally hunting other items, the AT Gold is an excellent choice. The smaller search coil and higher frequency provides excellent sensitivity to smaller objects, while the threshold adjustment and ground balance window functions offer extra control depending on the search conditions. If you’re less interested in gold and want an all-round machine for relics, jewelry and coins, the AT Pro is the better choice - especially as it’s cheaper. While it’s not as sensitive to tiny gold nuggets, it still provides great sensitivity. 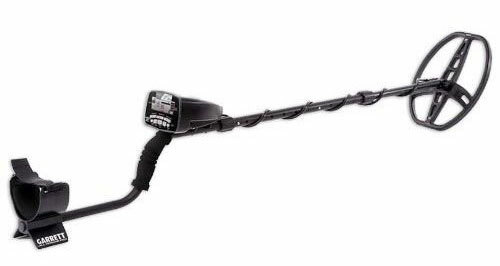 It’s also suitable for saltwater hunting, has adjustable notch discrimination and provides greater depth due to the lower frequency and larger search coil. I hope this article has cleared up the differences and similarities between the Garret AT Pro and AT Gold. If you have any questions, please use the comments form below.